← Does this Place Russia into NATO’s Category of a Failed State? If true that Monsanto purchased the religious, mercenary, organization Blackwater, Monsanto is now well prepared to enforce the growth of its Genetically Modified seeds. For marketing reasons, in effort to shed a history of rot, Blackwater crusader zealots have sought to bury their stench behind new incarnations of slogans; Blackwater to Xe, now Academi. Already we’ve heard GeoEngineering described as the new gold rush for capital investors on Game-Street; an umbrella for capital larceny, misadventure and misappropriation of forces. It’s all corporate driven, whose speculators perceive GeoEngineering as a cornucopia of gifts to be exploited. With the Weather Channel now in the hands of Monsanto, betting on weather swings and food prices is an inside traders dream! Monsanto Buys Climate Corp For $930 Million! This entry was posted in MONSANTO and tagged Academi, Amino Sweet, Aspartame, Blackwater, Clarence Thomas, Donald Rumsfeld, GMO, IG Farben, Mercenary, MONSANTO, Nazi, NutraSweet, Saccharine, Searle, World Chemical Dictator, Xe. Bookmark the permalink. This is exactly what has been going on for too long! Americans are sospupe to have freedom on speech and choice. However, when we say we don’t want GMO’s or we want our food labeled, they don’t take our votes into consideration. They look at the dollar signs and base their decisions on that!! I am outraged with this type of governing. I want my food to be WHOLE-NATURAL, not genetically modified. I have the right to have my food labeled. I have the right to choose what I want to eat and feed my family. Labeling ‘food’ should be just a start. This Frankenstinien practice should be stopped completely. 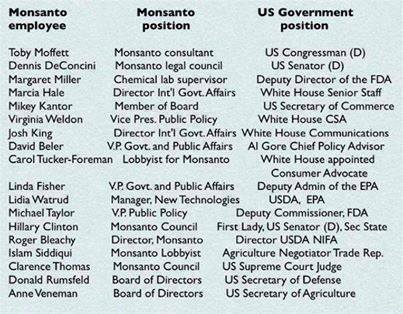 The many conflicts of interest and collusion between one time Monsanto employees and judicial and government appointments should be more than enough to bring a grinding halt to this dangerous contamination of our food supply. It just goes to show that there is NO oversight or agencies with the power or sense to stop the insanity. 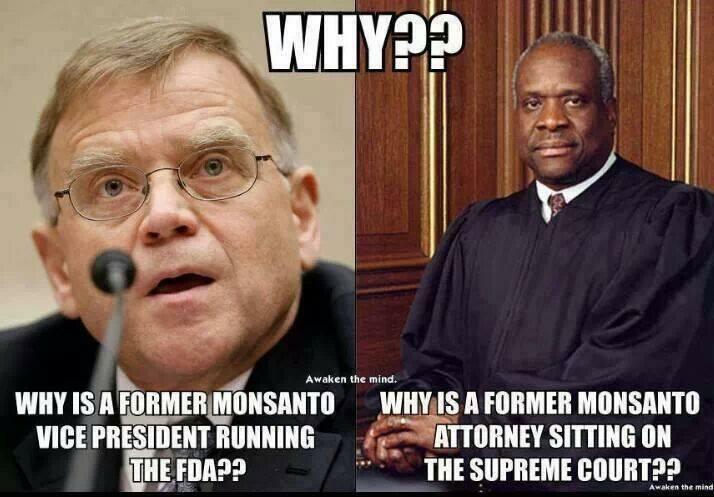 Do you think Monsanto management and employees eat their own Frankenfood?